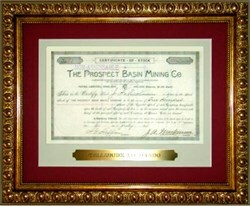 Beautifully engraved Framed certificate from the Prospect Basin Mining Company dated 1891. This historic document has an ornate border around it with an embossed raised corporate seal with a crossed Pick and Ax. The company's corporate offices were located in Denver, Colorado. This item has the hand signatures of the Company�s President ( J. A. Mackinnson ) and Secretary ( H. G. Heffron ) and is over 118 years old. Our sales price includes the historic certificate, framing as described above, labor, packaging and priority shipping within the continental U.S.. The town of Telluride was founded in 1878. The name Telluride is taken from an ore combining the element tellurium with a high gold content and some silver. The miners of Telluride worked deep below the surface in mines whose portals were as high as 12,000 feet above sea level. They worked ten or twelve hour shifts in mines and mills that ran around the clock. They lived in boarding houses precariously attached to plunging mountainsides. In the winter the snow buried the landscape and the trails down to the towns. At the height of the gold rush, nearly 5,000 people inhabited this small town whose motto was, "Town without a Bellyache." In fact, at the turn of the century, more millionaires (per capita) lived in Telluride than in New York City. 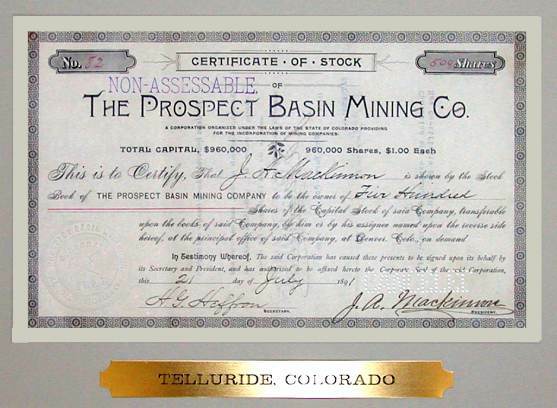 By 1904, more than $360 million of gold was pulled out of Telluride's mines. Today the mines overlooking Telluride are silent. Aerial trams leading up the mountains do not carry ore and miners, but rather skiers up one of the world's best ski mountains. Prospect Basin is the newest expansion area of ski lifts in in Telluride. This ornate, antique gold, wood frame is 1 1/4" wide. Overall frame size is 14 1/4" x 18 1/4". Color coordinated matting, clear glass, and acid-free backing are included with this ready-to-hang frame. Priority mailing cost of $10 is included with the prices shown to locations within the U.S. International and overnight mailing is available at actual cost.